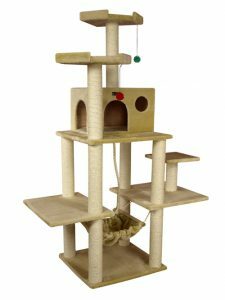 Cat trees or kitty furniture – no matter what you call them, it’s hard to deny the popularity of these products with both pet owners and their furry ones. Whether you’re dealing with a frisky kitten or a laid back old codger of a cat, this guide should help you find the best type of condo for your pet’s needs. Why Do Cats Love Their Condos? A well-designed cat condo by Molly and Friends, the Five Tier features large beds and some of the best rest areas we’ve seen. No matter the size of your felines, this model will ensure they’re comfortable. Created with high-quality materials, this tree comes fully assembled. 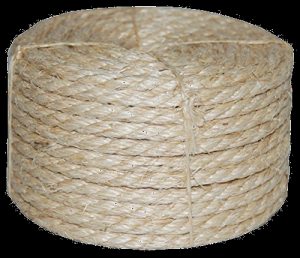 Natural sisal rope ensures your kitty can scratch away for days on end. Posts are covered in sisal rope and assembly is simple (despite being such a large contraption). Faux fur offers more comfort for your furry friends on the perches and houses. The neutral beige coloring usually works well in most rooms. 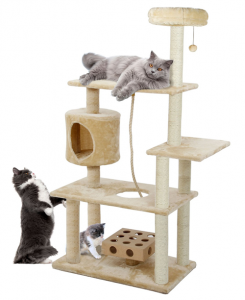 Standing 57″ high, the Armarkat Cat Tree is a great pick for those furry friends who love to be up high observing. The sturdy kitty condo is made of pressed wood and covered in a light faux fur. With a variety of activities like scratching posts, a bedroom, multiple perches and more – your pet is sure to enjoy playing in this condo. 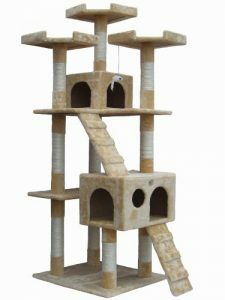 A giant condo measuring 50″W x 26″L x 72″H, the Go Pet Club F2040 is one of the best cat trees on the market. With 15 levels and ten posts, your kittens will find endless play options with this piece of furniture. Made with beige faux fur and sisal rope that blends in with most decors, your furry friends will feel comfortable laying and scratching anywhere. While not exactly space saving, this cat condo by Molly and Friends is sure to please even the pickiest of our furry friends. Standing a whooping 90″ tall, it offers a large bed and a variety of places to rest. No matter your pet’s size, they’ll be comfortable relaxing on this model. With high-quality materials like natural sisal rope and no assembly required, the “Virgie” has become a fan favorite with many felines. A great value for a 72″ tree, this beauty by Majestic Pet Products is covered in faux fur and sisal rope. 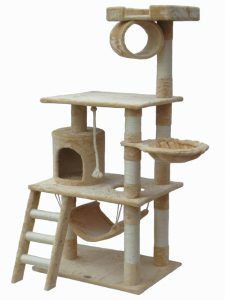 Offering simple assembly, this condo includes a fourth story kitty bedroom, two nests, two perches, a hanging toy and a large ladder. While this piece of cat furniture is large, we found it best for one to two pet households. The perfect kitty condo for small rooms and low ceilings, the 62″ Go Pet Club Cat Tree House is sure to please all your furry friends. Quality materials like pressed wood, faux fur, and sisal rope ensure a great experience for your cats. Felines who like tunnels often enjoy this tree a lot. With eight levels and a simple assembly process, there’s a lot to love about this model. An outdoor cat perch, the Kittywalk Penthouse with Resting Platforms is more of a shelter than anything else. Made with a weatherproof roof and hammocks along with a sturdy steel frame – the Penthouse is great for outdoor uses and balconies. The five-foot high vertical design is perfect for small apartments and terraces. 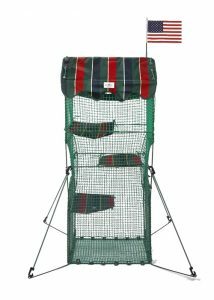 If protecting your pets from the elements, sunshine and overheating is important, than this is the ideal kitty condo for you. Molly and Friends are known for making some of the better cat trees in the USA, but what always stands out to me is – the size! The Pinnacle is another giant model from the company and stands at an incredible 90″ this time around. The condo is space saving due to the tall, yet skinny nature of the model however. Two condos, four cradles and over 30 inches of sisal rope lined posts ensure your feline is always entertained. If your kitten is a busy body, then the 70-75″ Armarkat may be just what the doctor ordered. 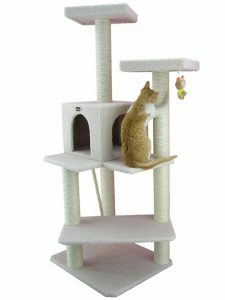 This model is great for felines who love to climb, exercise and play. 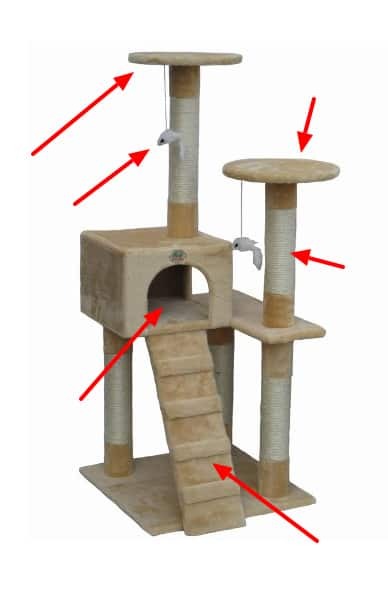 The endless amount of posts, perches, toys, bedrooms and ramps ensure your cat is always entertained. These days’ cat condos come in a wide selection. Some are made for play while others are created with relaxation in mind. Coming in all shapes, sizes, and configurations to fit any space – modern kitty furniture is sure to keep your pet(s) quite happy. Most trees offer a place to play, lay, scratch, climb, and get away from humans. And while the selection of furniture is impressive, it can be difficult for cat owners to select the perfect one for their feline. That’s where we come in. We’ve scoured the market and personally tested the absolute best cat trees on the market. We put together this detailed guide to ensure you select the ideal piece of furniture for your home. A cat tree is not a place your cat lives, eats, drinks, poops, sleeps in all the time, or is forced to find comfort in. No, this type of furniture is simply designed with playtime in mind. A kitty condo is meant to be used for enjoyment. These modern feline play palaces are built with perches, ramps, posts, climbing poles, play toys, and sitting boxes. Think of a the condo as a paradise for your purring furry friend. See, most cats love to jump, scratch and climb things. It’s natural and instinctual to the felines. However, the realities of indoor living leave much to the imagination when fun and feline is combined in one sentence. Kitty condos allow your fur balls to do all of these things in a constructive manner while no damage is done to your home. The furniture also allows your cats to get away from humans, children, and dogs from time to time. Most of these products can accommodate multiple cats at once. 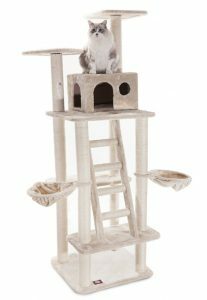 As one would expect from a product featuring such a wide array of offerings, you can find cat condos made of a variety of materials. Typically, they are made of pressed wood covered in faux fur. Plywood is also used, and often a much better option that pressed wood. Solid can be used, too. However, a kitty tree created with solid wood will often be much more expensive. Luckily, solid wood lasts much longer than press wood. So many find this investment worthwhile. Most posts found on on the furniture are covered in a material called sisal rope. Cats are naturally drawn to this material, as it’s the ideal material for scratching. Most feline owners find scratching of other furniture and door frames diminished when sisal rope enters the home. While old school kitty condos were covered in carpet, manufacturers and owners both found this material often wore out too quickly due to the continual scratching and clawing. Faux fur has been proven to be much better and durable when dealing with feisty felines. It’s important to note the weight bearing capacity of any cat furniture. The products have been tested to hold anywhere from 10-200 pounds, depending on the materials used and the quality of the condo. The sturdier a tree is, the more your cat will use it. No feline wants to be in a tree that is shaky or continually falling over. Most condos sit on the floor, but a few models hang from the ceiling. Make sure you select a cat tree that can hold the weight of every pet you call your own at once. If you have three cats, then you’ll need a model that can bear the weight of all three at once – at the minimum! The last thing to pay attention to when looking into the materials used for any piece if cat furniture is how it’s put together. 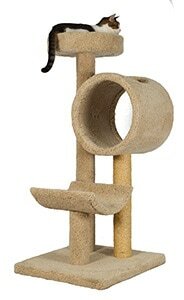 Cat trees constructed with screws are much more durable and sturdy than ones created with glue or nails. Always look for a tree with screws if longevity is of any importance to you. You’re considering buying a cat condo to give your furry friend another place to play. Cats are active creatures, and every product manufacturer knows this. So they try to include as many of your pet’s favorite activities into each piece of furniture. Any kitty condo that allows your furball to scratch, claw, hide, jump, climb, observe and sleep will be A-OK in their book. As you begin to look into the different features that are offered, it’s important to note what your little one likes to do. Think about what they do most around the house and look for a condo that incorporates that into the design. A variety of products offer hanging toys like balls, feather, and fake animals. Usually, these toys move and grab the attention of your feline. And once this occurs, you’ll find your furry friend grabbing, swatting and batting at the hanging object as they play. Younger kittens often are more fascinated with toys than older ones are. If you buy a condo that doesn’t offer a hanging toy, you can always attach one easily. Has your furry friend ever climbed into a shoebox or around wrapping paper at a birthday? Cats love climbing around and into different things. Due to this fact, most condos offer tunnels that your pet can crawl into and hide or sleep. Cats like to observe their surroundings from high up. You may notice your pet sleeping on the top or the couch, continually jumping onto the countertops or climbing trees. Thus, many kitty condos feature high perches and platforms that your furry friend can sit on and observe. Taller trees often feature a number of levels for your furry friend. These different levels are typically connected by ramps that connect each level together. Old cats especially love the ramps, as it makes getting from one level to another much easier than jumping. These different levels also are ideal for multiple pet households – as they offer numerous places to sit, observe or sleep. Last, but not least – most furniture has boxed rooms where cats can hide or sleep. The feline enters through a hole or doorway and finds some privacy. 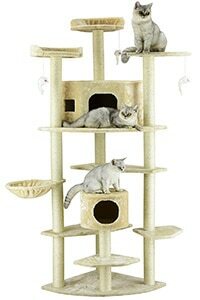 Larger cat trees can have up to four different sleeping areas. Just like cat furniture coming with a wide variety of activities, these condos also come in numerous different shapes, colors and sizes. Whether you want a simple tree or an all-inclusive amusement park for your furry friends, you can find what you want. Most feature colors that are neutral or dark. Some of the most popular tree colors include beige, white, navy blue or chocolate brown. If you’re particular about the color of your kitty’s furniture, then look for condos that offer a wide variety of color options. We’ve found neutral colors work better in most homes and décor. However, dark brown and navy blue color schemes have been found to mesh well with matching product colors. Nearly every cat will become enamored with the right condo. These exciting pieces of furniture are sure to provide endless amounts of entertainment for your furball(s). When keeping your cats happy, yet occupied is of utter importance – look no further than a kitty condo. 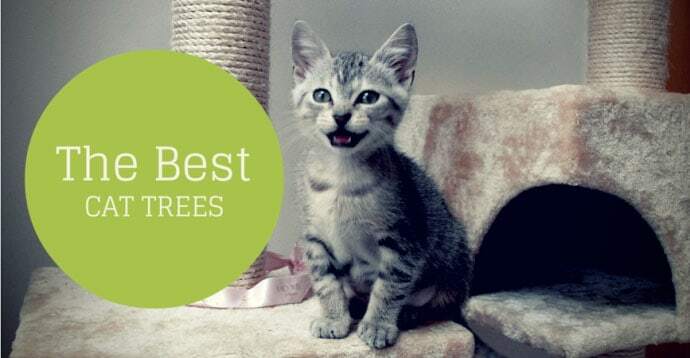 And when selecting the perfect cat tree – look no further in this guide. We detailed every aspect of these awesome products for you. We hope you can take the information and reviews you’ve found here and select the perfect piece of pet furniture for your home.